Figure 3 The mechanism by which phosphorylation of PKB, S6K SGK, and RSK by PDK1 is regulated. It should be noted that in this model of how PKB, S6K, SGK, and RSK are phosphory-lated at their T-loop, PDK1 activity is not directly activated by insulin or growth factors, consistent with the experimental observation that PDK1 is constitutively active in cells. 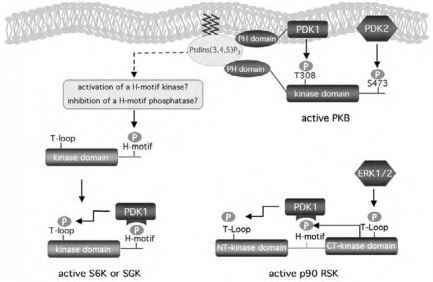 Instead, it is the substrates of PDK1 that are converted into forms that can be phosphorylated. 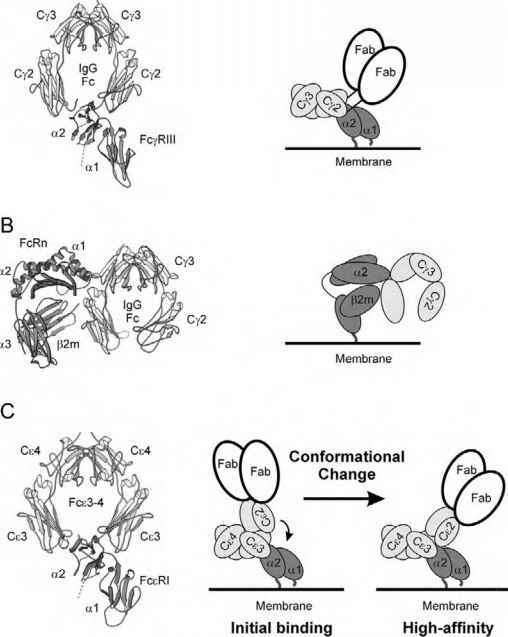 In the case of PKB, it is the interaction of PKB with PtdIns(3,4,5)P3 at the plasma membrane that colocalizes PDK1 and PKB and also induces a conformational change in PKB that converts it into a substrate for PDK1. In the case of S6K and SGK, which do not possess PH domains and cannot interact with PtdIns(3,4,5)P3, this is achieved by the phosphorylation of these enzymes at their hydrophobic motif (H-motif) by an unknown mechanism, which thereby generates a docking site for PDK1. RSK iso-forms possess two catalytic domains: an N-terminal AGC-kinase-like kinase domain and a C-termi-nal non-AGC kinase domain. The activation of RSK isoforms is initiated by the phosphorylation of these enzymes by the ERK1/ERK2 classical MAP kinases, which phosphorylate the T-loop of the C-terminal kinase domain. This activates the C-terminal kinase domain, which then phosphorylates the hydrophobic motif of the N-terminal AGC kinase. This creates a binding site for PDK1 to interact with RSK isoforms, leading to the phosphorylation of the T-loop of the N-terminal kinase domain and activating it. Phosphorylation of all RSK substrates characterized thus far is mediated by the N-terminal kinase domain; however, it is possible that the C-terminal domain of this enzyme will phosphorylate distinct substrates that have not as yet been identified. suggesting that this region of PDK1 does indeed represent a phosphate docking site . The only other AGC kinase for which the structure is known (namely, PKA) also possesses a hydrophobic pocket at a region of the kinase catalytic domain equivalent to that of PKA which is occupied by the four C-terminal residues of PKA(FXXF) and resembles the first part of the hydrophobic motif phosphorylation site of S6K and SGK (FXXFS/TY) in which the Ser/Thr is the phosphorylated residue . Occupancy of this pocket of PKA by the FXXF residues is likely to be essential to maintaining PKA in an active and stable conformation, as mutation of either Phe residue drastically reduces PKA activity toward a peptide substrate, as well as reducing PKA stability [106,107]. In contrast to the PIF-pocket in the PDK1 structure, PKA does not possess a phosphate docking site located next to the hydrophobic FXXF binding pocket. Sequence alignments of the catalytic domains of AGC kinases, including PDK1, indicate that all AGC kinases possess a PIF pocket, and kinases such as isoforms of RSK, PKB, S6K, and SGK possess a phosphate docking site next to this pocket. The role of these pockets of the AGC kinases is probably to interact with their own hydrophobic motifs, and this interaction may account for the ability of these kinases to be activated following the phosphorylation of their hydrophobic motif. However, unlike other AGC kinases, PDK1 does not possess a hydrophobic motif C-terminal to its catalytic domain and therefore utilizes its empty PIF/phosphate binding pocket to latch onto its substrates that are phosphorylated at their hydrophobic motifs, thereby enabling PDK1 to phosphorylate these enzymes at their T-loop residue and activate them.